"Next-Generation Sequencing (NGS)" is leading toward a new era of precision medicine. By comparing and analyzing DNA sequences, NGS precisely customizes treatments and prescribes medication for different patients based on the human genome database. NGS helps lead the fight against cancer and rare diseases by locating and storing information related to underlying causes and aiding medical personnel in preventing further spread and infection. However, against this positive backdrop, genetic service providers face a growing challenge: processing an endless array of genomic data. This time-consuming process hinders research and progress. To address the challenge, Advantech co-created an acceleration solution with WASAI, a Taiwanese company with expertise in genomics sequencing acceleration. 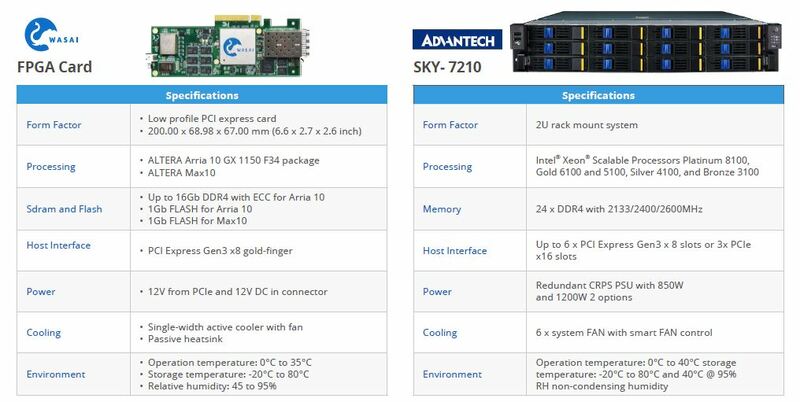 By combining Advantech’s SKY-7210 server with WASAI’s FPGA card, a lightning-fast solution was devised: a genetic sequencing all-in-one server that optimizes and accelerates data processing, specifically designed for the precision medical industry. With the Lightning Solution platform, germline analysis pipeline processing time can be reduced by up to 25 hours, from nearly 33 hours to less than 8, for greatly improved efficiency and reduced TCO (total cost of ownership). The Lightning Solution has now been delivered to research institutions, biobanks, clinics, and hospitals, providing greater flexibility and agility in genomic data analysis and pushing up the value of precision medicine. Advantech’s Lightning Solution is available now. For more information, please contact an Advantech local sales office. The Lightning Solution provides a painless upgrading process with native BWA-MEM and GATK for processing secondary analysis of the germline pipeline. Users can complete the analysis of Alignment, Sorting, Mark Duplication, and Variant Calling without changing the workflow. With the acceleration in native algorithms on Lightning Solution, the overall accuracy of SNPs and INDELs is 99.9% - the same as the original software. Moreover, the Lightning pipeline provides exactly the same output file formats as the original software. Lightning Solution offers a platform for big data and deep learning deployment on a server with up to 3TB DDR4 slots, 3 x NMC (Network Mezzanine Card) and 2 x 300W GPU or 6 x 150W GPU for reduced latency of data movement from HDD to FPGA. The connections are more flexible and easily accommodate future expansions. Time-Saving: From 33 hours to less than 8 hours for calling time. Accuracy & Consistency: Lightning Solution provides excellent performance. Overall SNPs and INDELs precision, variants’ recall, and accuracy are consistent. Multiple Applications: Lightning Solution uses the optimized BWA+GATK algorithm that can be applied to the Whole Genome Sequencing (WGS), Whole Exome Sequencing (WES), cancer diagnosis, and more. All-in-One Solution: Lightning Solution integrates the FPGA (Field Programmable Gate Array) card with the server to effectively accelerate secondary analysis.